On the 16th (Sat), explore the wealth of natural beauty at Badlands National Park. Get ready for a full day of sightseeing on the 17th (Sun): take a memorable drive along Loop Road, then explore the striking landscape at Badlands Wall, and then look for all kinds of wild species at Roberts Prairie Dog Town. For photos, other places to visit, maps, and more tourist information, you can read our Badlands National Park trip planner. Rochester to Badlands National Park is an approximately 6-hour combination of shuttle, flight, and taxi. You can also do a combination of flight and taxi; or drive. The time zone difference when traveling from Rochester to Badlands National Park is minus 1 hour. When traveling from Rochester in March, plan for somewhat warmer days and about the same nights in Badlands National Park: temperatures range from 52°F by day to 22°F at night. Finish up your sightseeing early on the 18th (Mon) so you can travel to Bozeman. Bozeman is a city in and the county seat of Gallatin County, Montana, United States, in the southwestern part of the state. Start off your visit on the 18th (Mon): make a trip to Emerson Cultural Center and then see what you can catch with a fishing tour. For where to stay, traveler tips, photos, and other tourist information, read our Bozeman itinerary planner . You can do a combination of taxi and flight from Badlands National Park to Bozeman in 6.5 hours. Alternatively, you can drive. In March, daily temperatures in Bozeman can reach 49°F, while at night they dip to 24°F. Cap off your sightseeing on the 18th (Mon) early enough to go by car to West Yellowstone. On the 19th (Tue), look for all kinds of wild species at Firehole Canyon Drive, tour the pleasant surroundings at Purple Mountain Trail, and then look for all kinds of wild species at Grizzly and Wolf Discovery Center. For where to stay, traveler tips, photos, and other tourist information, read our West Yellowstone trip maker site . You can drive from Bozeman to West Yellowstone in 2 hours. Alternatively, you can take a bus. Traveling from Bozeman in March, things will get slightly colder in West Yellowstone: highs are around 37°F and lows about 17°F. Finish up your sightseeing early on the 19th (Tue) so you can go by car to Great Falls. Great Falls is a city in and the county seat of Cascade County, Montana, United States. Kick off your visit on the 20th (Wed): contemplate the long history of First Peoples Buffalo Jump State Park, then appreciate the extensive heritage of Lewis and Clark Interpretive Center, and then admire the majestic nature at Giant Springs State Park. Plan my Great Falls trip by asking Inpirock to come up with tips and suggestions. You can drive from West Yellowstone to Great Falls in 5 hours. Alternatively, you can fly; or do a combination of flight and shuttle. In March, Great Falls is a bit warmer than West Yellowstone - with highs of 48°F and lows of 24°F. 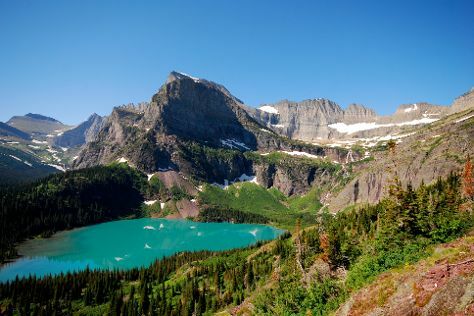 Cap off your sightseeing on the 20th (Wed) early enough to go by car to Glacier National Park. Visiting Waterton-Glacier International Peace Park and Iceberg Lake Trail will get you outdoors. And it doesn't end there: cruise along Going-to-the-Sun Road, trek along Grinnell Glacier, admire the sheer force of Silver Staircase Falls, and look for all kinds of wild species at Goat Lick Overlook. To see photos, more things to do, where to stay, and more tourist information, refer to the Glacier National Park trip planner . Drive from Great Falls to Glacier National Park in 4.5 hours. Alternatively, you can do a combination of bus, train, and car. In March, daytime highs in Glacier National Park are 46°F, while nighttime lows are 25°F. Wrap up your sightseeing on the 23rd (Sat) early enough to travel back home.